Jafar Panahi's Offside has a contagious spirit even as it sadly demonstrates the lack of gender parity in Iranian culture. It reminded me of an experience I had on the eastern shore of Istanbul back in 2000 where a friend took me to a small bar to watch a televised soccer match between Turkey and another country (France? Greece?). Turkey won and I've never been hugged and kissed by so many swarthy men in my life!! Panahi introduced his film by thanking the festival for showing his new film so that he could sit with us and watch it with the rest of us to see how he felt about it. He let us know that he was an avid soccer fan and that five years ago he had the unexpected experience of having his daughter proclaim she was coming to a soccer game with him. He advised her that, unfortunately, he couldn't take her with him because they wouldn't let her in. She insisted on going and so he told her, okay, I will take you there, but, there's one thing you have to know: if they don't let you in, you'll have to find your way home yourself because I'm still going to go into the game. So he took her to the game and he went up the guards and he told them he had his daughter with him and asked them to let her accompany him. Of course they refused. He was about to begin begging them to let her in when his daughter pulled him aside and told him there was no reason for him to beg on her account. She told him to go on in and she would get in "her way." He went inside thinking that would be the end of that and within ten minutes she was sitting beside him. How did you manage that, he asked her, how did you get in? She told them that women had their own ways of getting in. This is what gave him the idea for Offside; he became fascinated by the strategies women were forced to use to watch a soccer match. He regretted that his daughter couldn't attend the Toronto festival because he would have liked to dedicate the screening to her; but, a good friend of her's was there and so he dedicated the screening to his daughter's friend. Afterwards, Panahi was asked what would have happened to the girls if they hadn't gotten away from the vice squad. Usually, Panahi explained, if it's a first time offense the girls will be locked up for a couple of days and then the parents have to come to get them and have to promise their daughters will never do anything like that again. If they get caught again, the penalties get heavier. 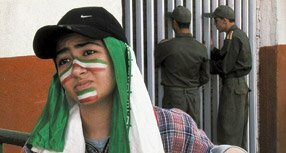 In the film, Iran wins the game in the final half and the ensuing celebration constitutes the latter scenes of the film. Since Panahi appeared to be filming in real time on location, someone asked Panahi if he had an alternate ending in mind should Iran lose? Of course, he was personally praying for Iran to win but, yes, it would have been a real problem for him filming-wise if Iran has lost because, no, he wasn't prepared for any other outcome, he was really wishing they would win, and wishing they would score later in the game just as they did, and wouldn't have known what to do if it had happened otherwise. Towards the end of the film, one of the girls starts crying during the celebration and then asks a young man selling fireworks if he will sell her seven sparklers, which he does, lighting them for her. Panahi was asked what was the significance of the seven sparklers? Panahi related that, before this game, there had been a match between Iran and Japan. There were so many people at this game that, as the crowd was leaving, seven individuals were trampled to death. The girl in the film alludes to the fact that she had wanted to attend the game in remembrance of her friend, who was one of the seven, and not because of any overriding interest on her part in the game itself. What was especially tragic about this event was that the reason it happened was because there was a military helicopter at the stadium that wasn't supposed to be there. Apparently some big brass was at the game and the helicopter had come to fetch him, even though it was not supposed to be there. To keep the crowds away from the helicopter, they were hosed with water. It was very cold and the water made the ground slippery, causing the seven people to fall and be trampled. As a matter of fact, after this incident the Iranian press only showed six pictures of the seven people killed, six photos of six young men, and it is rumored that the seventh was a young woman who had snuck into the game. Panahi felt it was important to pay tribute to this seventh victim who was rumored to be female. Panahi was asked if Offside would show in Iran and if the young women who played the protagonists had any previous acting experience. Earlier in February Offside was actually screened at a film festival in Iran, a first for Panahi, and he had hoped this would lead to a wider distribution of the film, especially before the World Cup. Unfortunately, this didn't end up being the case. None of the actors in his film, male or female, were professionals; they were appearing in front of the camera for the first time in their lives. Panahi was asked if he felt that, within his lifetime, making his progressive films, and with many other cultural changes occurring in Iran, if he thinks things will change more significantly in the country? Conceding that his culture is a very old one and that his country has had many difficulties that they've had to overcome, Panahi acknowledges that now Iran is going through another very difficult period that all of the people are trying to endure. He prays that this difficult time will not last too long and that this "tiny" human freedom that they are struggling to have, that everyone should have, will fall within their grasp. Of course he remains hopeful and optimistic and his aim is to be a witness to history of the difficult times his country is going through. He hopes to leave a "print" of this period, to show what the Iranian people have suffered, and how they have persevered. 09/17/06 UPDATE: Doug Cummings has capsuled Offside for Film Journey, noting it as Panahi's "most vibrantly energetic and entertaining film to date, without compromising his social vision one iota." Part of the film's "subversive brilliance", Doug explains, is that it's a highly patriotic film through characters who "are not dissenters, but rabid fans as equally committed to the sporting cause as the next person. Their only 'fault'—as suggested by one prisoner—was to be born female." He announces the film's dvd release in the UK mid-September and concludes that he "couldn't recommend it more highly." 09/29/06 UPDATE: Greencine's David D'Arcy has seen Offside three times now, in Berlin, Toronto and (most recently) at the New York Film Festival. As ever, his synopsis is insightful. He writes: "Not to overplay the obvious metaphors, but Panahi is presenting Iranian women unveiled. Not uncovered, since they're in boys' clothes. No one's claiming that these fans represent all Iranian women - a claim that would be far too abstract or didactic for a filmmaker of Panahi's refinement - yet there's a determination and a women's solidarity here that the regime surely isn't going to welcome. You'll be struck by the earthiness of what they say. There's nothing like the right jeer to deflate pomposity." Further, he pointedly notes that although Panahi was available for his audiences in Berlin and Toronto, he won't be in New York because he couldn't get a visa. This makes me all the more glad that I got to hear him speak in Toronto.